Energy Saving by S.Mercer Plumbing. Updating your central heating controls could save you up to £60-£70 a year, as well as increasing your comfort conditions. 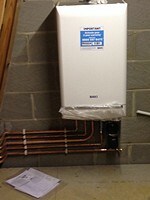 A 80mm thick, hot water cylinder jacket will save you £30 per year, lagging the hot water pipework could save you money. Turn your thermostat down. Reducing your room temperature by 1°C could cut your heating bills by up to 10 %, saving you around £60 per year. A cylinder thermostat, properly fitted and set, could save you £15 a year. For more advice on saving money and energy please click on the link below.